We just got the following update from Dr. Mark Cucuzzella, who is working on the most in-depth course on running injury prevention ever put on in the US. If you are a PT, MD, Exercise Physiologist, Athletic Trainer, or Retailer this event will be invaluable to your continuing education. Over 60% of runners are injured every year. Insurance companies now are re-evaluating the advice to get fit if it involves running and the subsequent injuries and costs of expensive imaging studies and treatments. 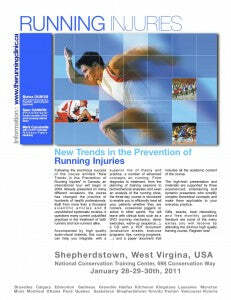 “We need to develop entirely new approaches to running injuries and stop just treating the symptoms. We need to look at what factors are causing the injuries and design easy to evaluate and specific corrections to the causes,” says Mark Cucuzzella MD, an elite Master’s runner, physician, and teacher of healthier running. 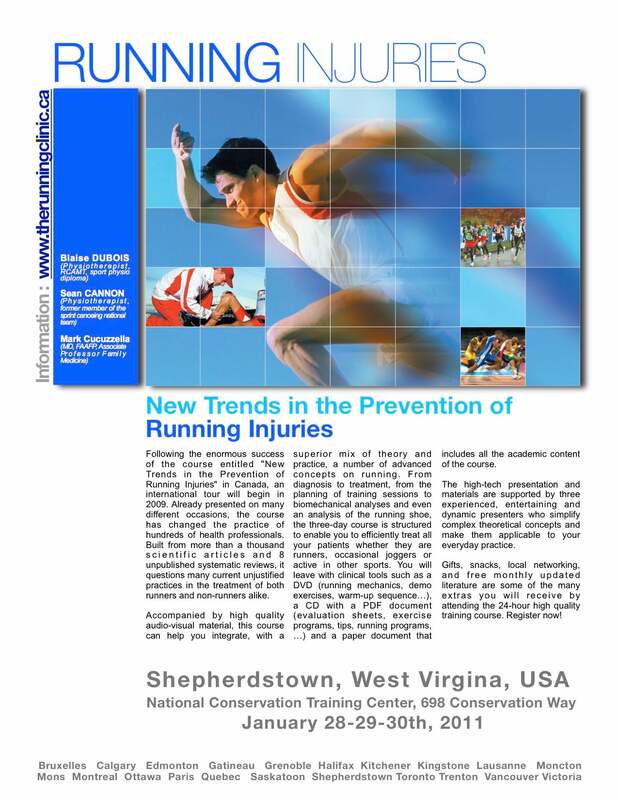 Following the huge success of the course entitled “New Trends in the Prevention and Running Injuries” in Canada and Europe, the course will come to America on January 28-30 in Shepherdstown, WV. This course designed for all health professionals, coaches, and fitness teachers working with active patients has changed the practice of hundreds of health professionals worldwide. Accompanied by high quality audio-visual material, this course can help you integrate a number of advanced concepts on running. From diagnosis to treatment, from the planning of training sessions, to biomechanical analyses, and analysis of the running shoe- the three-day course is structured to enable you to efficiently treat all your patients whether they are runners, occasional joggers, or active in other sports. Participants will leave with clinical tools such as a DVD (running mechanics, demo exercises, and warm-up sequenes), a CD with a PDF document (evaluation sheets, exercise programs, tips, running programs, etc.) and a paper document that includes all the academic content of the course. Physical Therapy Running gurus Blaise Dubois and Sean Cannon from Canada and Jay Dicharry of University of Virginia, and physician Mark Cucuzzella will lead the hands on sessions. The high-tech presentation and materials are supported by experienced, entertaining, and dynamic presenters who simplify complex theoretical concepts and make them applicable to your everyday practice. Gifts, snacks, networking, and free monthly updated literature are some of the many extras you will receive by attending the 24-hour training course. Register now….course limited to 30 participants.